97th Street has an energy all its own. On the border of affluent Carnegie Hill and East Harlem, it provides a soundtrack all its own. Hip hop, rap, Hispanic music and even the occassional blasting Russian pop tune all provide me with an experience like no other. The building next to mine has a tenant who wants to share her window-front art with us. 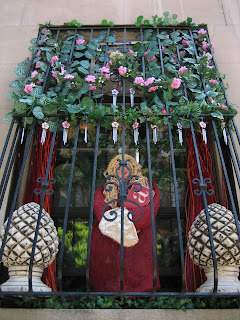 Detailed embellishments grace her windows behind the bars. Each season (or week) brings new displays. Lately there is a very loud soundtrack that goes with these displays. Thank you, Phantom Window Art Displayer of 97th Street. I dig your energy.